MSI is showing off at CES this week a new external graphics solution that can connect to a Mac through a high-speed Thunderbolt port. The MSI GUS II, highlighted by AnandTech, relies on the high bandwidth capacity of the 10Gbps Thunderbolt port found on the latest Mac models, including the MacBook Pro and MacBook Air. "The external chassis features a Thunderbolt interface and an internal PCIe slot," Anand Lai Shimpi noted. "Despite running on a MacBook Pro there is currently no OS X support for the solution, but it does work under Windows. Presumably if there's OS X support for the GPU inside the enclosure it would work under OS X as well." No timeframe for launch or price for the external GPU were given, but the product could be a solution for users who want more graphics processing power for their MacBook when it's in use at home. The GPU featured in the MSI GUS II must be powered by PCIe alone, as there are no auxiliary power connectors inside the device. 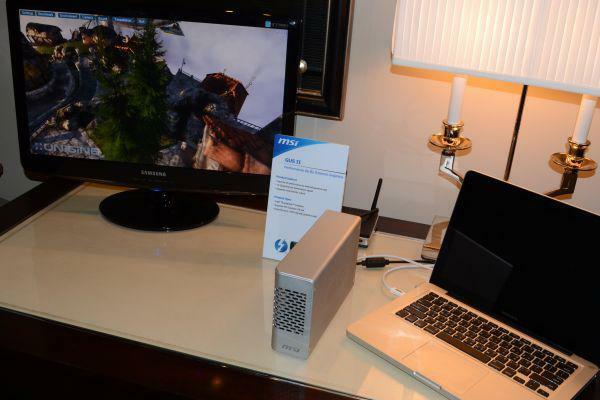 Thunderbolt-based external drives have also been prevalent at CES this year. Seagate plans to ship by the middle of this month adapters that will allow existing Seagate GoFlex drives to fit into a Thunderbolt slot, while Western Digital plans to release new Thunderbolt drives by the middle of 2012. Another Thunderbolt accessory highlighted on Thursday is Belkin's Thunderbolt Express Dock, which will allow users to plug in multiple USB devices through one docking station. The product is expected to launch this September for $299. Henge Docks revealed on Tuesday that it has made available for preorder two new vertical docking stations for Apple's thin-and-light MacBook Air. The docks aim to make it simple for users to place their notebook in the station and use it in a desktop setup or with a home theater system. "The Vertical Docking Stations for the MacBook Air line are Henge Docks' first to feature fully integrated ports, right out of the box with no additional setup," the company said. "Integrated ports combined with a sturdy, rubberized cradle for a precision fit means a smooth, accurate docking experience allowing users to quickly connect and disconnect their peripherals in one easy motion. Henge Docks' unique vertical orientation saves desk space while showcasing the svelte profile of the MacBook Air." 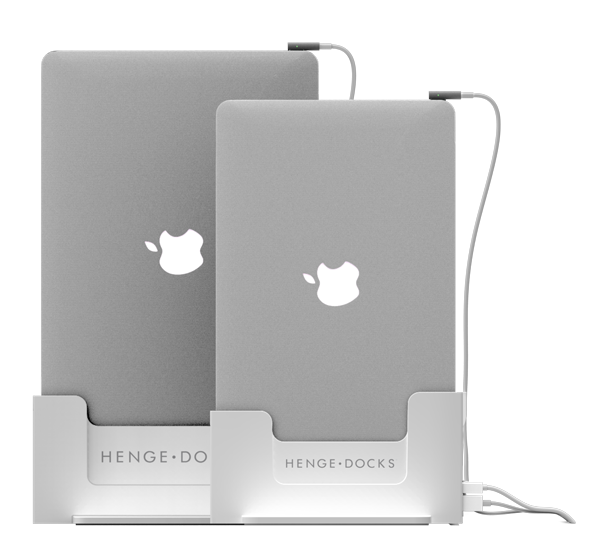 The Henge Docks design does not require any hardware, software or settings changes to a computer. Every current MacBook is compatible with the system. The new MacBook Air docks come in sizes of 11 inches and 13 inches, and feature Mini DisplayPort and USB pass-through. The 11-inch MacBook Air dock will retail for $55, while the 13-inch model is $60. "We are excited to add the MacBook Air Dock to Henge Docks line of docking station solutions," said Matthew Vroom, CEO. "The MacBook Air is a fantastic machine and we feel that our new docking station takes the Air to the next level by eliminating the cable clutter that plagues todays workspaces."